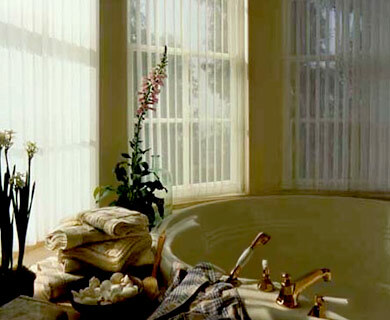 Luminette Privacy Sheers add the finishing touches to this bathroom decor. The softly sculptured folds of fabric extend from the tailored five inch header to the crisp bottom finish. The tailored header conceals the proprietary SofTrak™ operating hardware as the sheers traverse along the rod with one effortless motion. This patented revolutionary system ensures smooth and reliable operation and consistent vane spacing. And there's also an innovative combination wand and cord that is easy to operate and ensures a full range of light control.